The Vancouver Canucks new general manager Jim Benning didn't waste any time in moving disgruntled centre Ryan Kesler in the biggest move on the first of two days at the NHL draft. Jason Spezza still is with the Ottawa Senators. Tyler Myers still resides with the Buffalo Sabres. Joe Thornton and others who have been part of trade speculation surrounding the NHL draft remained with their clubs. But new Vancouver Canucks general manager Jim Benning and his Pittsburgh Penguins counterpart Jim Rutherford did their best to shake up the first day of the two-day affair in Philadelphia. The Penguins moved sniper James Neal to the Nashville Predators for forwards Patric Hornqvist and Nick Spaling. Benning accommodated Ryan Kesler's trade request. The Canucks moved him to the Anaheim Ducks for 22-goal centreman Nick Bonino, 24-year-old Luca Sbisa as well as the Ducks first-round (24th overall) and third-round (85th overall) selections. A couple of hours later, Benning convinced defenceman Jason Garrison to waive his no-trade clause. So Garrison was shipped to the Tampa Bay Lightning along with the rights to left wing Jeff Costello, who has finished his four years at Notre Dame, and a seventh-round pick for the Lightning's second-round pick at No. 50. The Canucks also parlayed the third-round pick in the Kesler trade to the New York Rangers in exchange for robust fourth-line right wing Derek Dorsett. 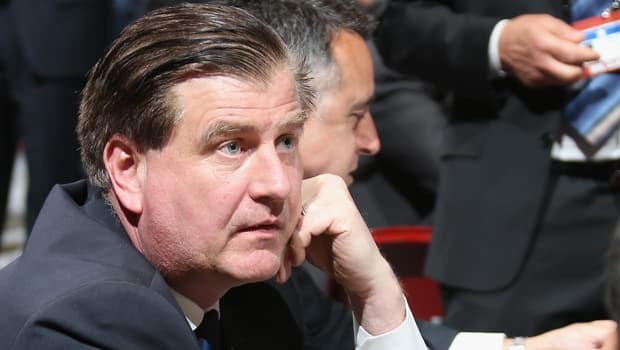 The club's new motto is "Change is Coming" and Benning certainly followed through with action. He also made a bid for the Florida Panthers' first-overall pick as did the Philadelphia Flyers and Tampa Bay. But Panthers GM Dale Tallon decided to hold onto the pick and select Barrie Colts defenceman Aaron Ekblad because the offers from the three teams just weren't up to snuff. "I wouldn't say it's a rebuild," Benning said. "We acquired players that are going to have an impact on us winning this year. "When I took the job, Ryan asked to be moved. He's been a great player for us and I worked with his list [Anaheim, Chicago Blackhawks]. We wanted the Ryan deal done before the draft so picks could be included. We're happy that happened. Ryan felt like he needed a fresh start and we don't want someone who doesn't want to be here." With his two first-round selections, Benning and his scouting staff chose local product Jake Virtanen, a 6-foot, 208-pound right wing of the Calgary Hitmen, with the sixth-overall pick. Eighteen picks later, the Canucks drafted 6-foot, 179-pound Sault Ste. Marie Greyhounds centre Jared McCann. The Canucks weren't the only Canadian NHL team to have an early first-round pick on Friday. Here were the others taken by the Canadian teams in the first round (the Ottawa Senators gave up their first-round choice in the Bobby Ryan trade last summer). The 18-year-old Ekblad became the 13th defenceman to be taken first overall since the draft's inception in 1966, but first since the St. Louis Blues selected Erik Johnson first in 2006. When Tallon made his announcement, he paused after stating "from the Ontario Hockey League" and then said Ekblad's name. But the Panthers knew all along that Ekblad, one of 14 Canadians selected in the first round, was their man. "They didn't tip their hat or show any cards off the table," Ekblad said. "They were joking around with me a second ago and said they knew from the very beginning, but who knows? Obviously, they want to look for the best possible option and if they believe in me, then that's great." Ekblad became the sixth OHL player in the last eight drafts to be selected first overall, following Patrick Kane in 2007 (London Knights), Steven Stamkos in 2008 (Sarnia Sting), John Tavares in 2009 (London Knights), Taylor Hall in 2010 (Windsor Spitfires) and Nail Yakupov in 2012 (Sarnia Sting).